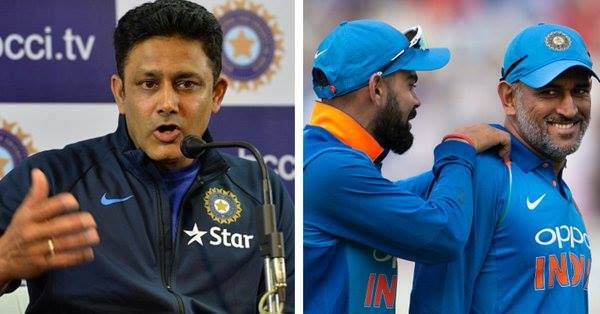 New Delhi: Former Indian captain Anil Kumble has said that MS Dhoni's presence in the team has helped skipper Virat Kohli to take relevant decisions on the field. ''Virat is comfortable, if Dhoni is around him on the field, as he takes right decision under the guidance of Dhoni,'' the former coach added. ''I think he is certainly more comfortable, rather saying better captain; he is probably a lot more comfortable when MS is behind the stumps and then the conversation between him and Virat definitely helps him take the right decisions,'' he further said. In 2014, Dhoni had handed over the captaincy of Test cricket to Virat, while in 2017, Kohli became the ODI captain, as well. This year, he will be playing his last World Cup. While praising Dhoni's leadership, the former captain said, "Dhoni has been the captain of the team for a long time and he has no shortage of experience. He understands the game better, even though he is behind the wicket. He consistently talks to the bowlers and gives them suggestion about the coming deliveries."